ERGO Network visited its member La Voix des Rroms in France between March 16 and 18, 2018. 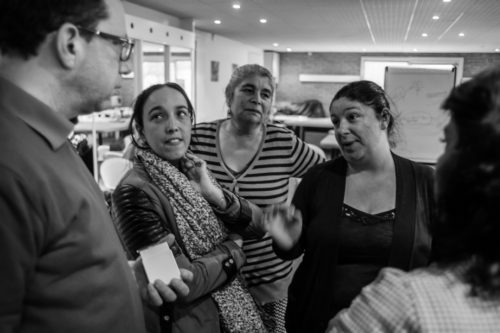 The purpose of the visit was to take part in one of the meetings of the Rromani Resistance Movement, learn about the fights of the French Roma and Gens du Voyage and think together how we can support each other. The participants were activists from different regions of France: women from Northern France who organized themselves in their community to fight environmental violence, Roma from Paris, Saint Denis, Bordeaux, Nice, a sister and her friend who seek justice for Angelo, a man killed by the French police, Raymond Gurême a Roma genocide survivor with his daughter and many others. Gens du Voyage women who fight environmental violence ask no more than for their right to health. Their camp is surrounded by factories and railways. The consequences of the bad position of their camp on their health are severe. In addition, the toilets are cold, outside of the premises they live in. They have talks with relevant authorities who are supposed to react, especially because there is a French law that does not allow the conditions this community lives in. Even though the process is slow, the women we talked to expect their camp to be moved sometimes next year. In general, in France, there are not enough caravan camps. In this community in Northern France there are about 500 people not only at risk but already having health issues (skin problems, for example). The women have written to the mayor and are waiting for the response. A specialist is also going to access the consequences of these living conditions on the people’s health. These women activists are sending a message that they want to move their camp and to have toilets inside – all they want is their basic rights to be respected. You can read more about the women living in Hallemes-Ronchin dedicated caravan sight in the suburbs of Lille we met, but also more about “a significant gap between the officially stated goals of such sights and the reality of life within them” in an article written by Lise Foisneau here. Beside environmental violence, one of the big problems in France is police brutality. Aurelie, a sister of Angelo who was murdered by some French police officers, and few supporters formed “La justice pour Angelo” movement. 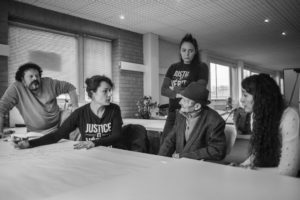 On the 31st of March, in the city of Blois, Angelo Garand’s family and their supporters will march to remind the public that it is intolerable to kill someone just because he is a prisoner and a Roma. A month after the march, on April 30th, the judge will decide if there is enough evidence and if the police officers are going to be sent for a trial. More information about the case and the opportunities to support the cause can be found here and here , and at the Facebook page of Angelo’s family. After an exciting day and a half of learning, getting to know each other, learning more about the 16th of May – Rromani Resistance Day from our partner from La Voix des Rroms Saimir Mile and working in small groups following Tara Dickman’s and Anina Ciuciu’s presentation of community organizing methodology, figuring out the most efficient and effective next steps, Sunday was about connecting past and present, listening a research findings of Lise Foisneau and Valentin Merlin about the resistance of “Nomads” during the Second World War. The public in general lacks the knowledge about Roma genocide, but even less known is the resistance of the Roma, which was continuous and had both an individual as well as an organized dimension. Next Next post: Join us at the EU Roma Week 2018!